Divorce and Children: How Can Your Kids Ministry Help? Divorce and Children: How Can Your Ministry Help? You can help! If you were a child of divorced parents, please click here to take a survey related to your experience. This will help us better understand the challenges divorce presents to ministry. You might be surprised to find out that the divorce rate in the United States is actually decreasing and has been since it reached its high point in the early 1980s. Despite the relatively small decrease, it is still an epidemic. Recent studies show that the projected divorce rate for first marriages in this country is approximately 43%. For second marriages, that rate shoots up to 60%. Indeed, while the decrease in the rate of divorce is a good thing, it is driven primarily by an increase in cohabitation and failure to marry rather than a “real” decrease in divorce. Although many Christian churches attempt to dissuade congregants from getting a divorce, the research confirmed a finding identified by Barna a decade ago (and further confirmed through tracking studies conducted each year since): born again Christians have the same likelihood of divorce as do non-Christians. Asked to consider two views about divorce, a majority of the general public chooses “divorce is painful, but preferable to maintaining an unhappy marriage” over the view that “divorce should be avoided except in an extreme situation” (58% to 38%). You will find only a few books on divorced families, at least in proportion to the number of divorced families in this country, and most of them are upbeat guides on how to divorce rather than in-depth looks at the lives of divorced children. Strangely, our culture seems only too happy to talk about dysfunctional intact families – to point fingers at all the ways married parents can mess up with their children – but it falls silent about divorce because no one wants to make divorced parents feel bad. Consider that half of the children in America today will live through the divorce of their parents. Of that 50%, half of those children will see the dissolution of their parents’ second marriage as well. 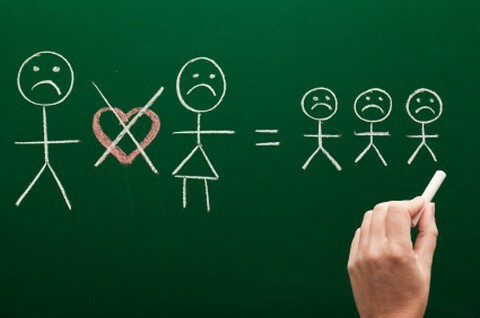 Since roughly 1972, over 1 million children each year have experienced the divorce of their parents. By 2008, 3 out of every 10 minor children were living in a single-parent home (note: this does not include children of divorce whose parents had remarried). Recent studies show that divorce rates in rural America are now just as high as those in suburban and urban America. The point is, there is no doubt that children of divorce are not only present but prevalent in your children’s ministries. It is our job to minister to these kids, and part of that process is understanding what they are going through. Of those grown children of divorce who were active in a church at the time of their parents’ divorce, two-thirds said that no one from the clergy or congregation reached out to them at that time. As a church, we have largely failed these kids. That is not true of every local church, but it is true of many. We have turned a blind eye to the special needs of these children because we were unaware of the issue, unwilling to address it or afraid that somehow ministering to these children would be construed as condoning the act of divorce itself. It is high time that we got past these fears and insecurities and got about the business of ministering to God’s children. These kids are as important to God as any others. We serve a God who “binds up the brokenhearted.” It is time that we acted as his hands and feet to these kids who natural support systems (their families) have imploded at a time when they need them the most. It is time that the church stepped in, in whatever way that we can, to fill that void. Children of divorce are always missing someone. Kids love their parents and generally don’t understand why they can’t get along. When they are with mom, they miss dad and vice versa. This will continue for their entire childhood, and likely beyond. Divorce shatters a child’s foundation. Everything they have believed in and everything that they have counted on shatters in an instant. They begin to question (throughout their childhood) all aspects of their lives. To a child, divorce is not a single event. It is a trigger that changes their lives forever and which they may never fully recover from. Children who spend time in different homes with two different families often report that they feel like two different people depending on where they are staying. That’s why is important try to relocate not too far from your children. The rituals that a child has become accustomed to are often shattered during a divorce. Children desire ritual, and they are likely to replace these lost rituals with unhealthy ones if healthy alternatives are not provided. Younger children are likely to regress in their behavior as their parents move through the divorce process. Divorce is something that children need to grieve. However, their grief does not move along a straight line. Instead, many children are likely to re-experience the grief of their parents’ divorce as they move through each developmental stage. Many children experience the loss of childhood going through a divorce as they are expected to take on many more adult responsibilities. There is much that we, as the church, need to do to minister to this oft-neglected mission field of Children of Divorce. This article is all about the first step – getting the conversation started! Additionally, we have created a group on CMConnect.org to further discuss ministering to children of divorce. Make sure to stop by and join Leading With Love. We are blessed to have some experts amongst those who monitor the forum for questions and discussions. If your church is interested in doing something to help these kids, make sure you check out the Divorce Care for Kids (DC4K) curriculum. Also, make sure to check out the personal website of Linda Ranson Jacobs. That site is Hlp4. Linda was our guest on Kidmin Volunteer Radio to talk specifically about ministering to children of divorce. She is actually the author of the DC4K curriculum, and I am certain that she would be happy to talk to you more about it if your church is interested. You can contact her by using this form on her website. Tony Kummer (Editor) reviewed & updated this page on : March 27, 2019 at 10:46 am. All our content is peer reviewed by our readers, simply leave a comment on any post suggest an update.